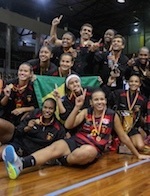 Americana outplayed Ourinhos 82-67 on Sunday night to win the 2012 South American Club Championship title. Karla Martins (172-G-78) was the leading player in victory with 28 points. Mama Dantas (191-C-78) helped with double-double of 13 points and 12 rebounds, while Tassia Carcavalli (179-F-92) added 12 pts. In the loosing squad, Joice de Souza (174-G-86) delivered 18 points. Quarters: 29-16, 20-13, 18-18, 15-20. Americana won the title in Quito with perfect score. They had 5-0 in Preliminary Round, before they celebrated in the Big Final. Third place in Quito belongs to UTE. They outplayed Lanus yesterday 88-84. Angelica Robinson (196-F-87, college: Georgia) was a key player in victory with 23 points and 13 rebounds. In the battle for fifth place Malvin handed 73-61 loss to Regatas. Malvin was winless in the Preliminary Round, but at the end managed to avoid the last place at this event. Eboni Mangum (173-G-87, college: TCU) led the Uruguayan squad yesterday with 21 points and 6 boards. Karla Martins of Americana was named MVP of the championship.